This site is Integral, and this site is Musical. More than that, though, Music, to me, is the way Beings sing of Love. The mystic Abraham Isaac Kook (1865-1935) wrote this amazing passage, one I would say is fundamentally integral, about the various songs of Love that can be sung. What follows is my slight modification of a translation by Rochi Ebner (1996). I offer it here as a framework for the various musicians and pieces of music that I'll be adding to this section of this website, which it self is Shir El, the Song of God. who sings the song of the Nation. the inner content of her soul. his aspirations and his visions. who "engages daily in a chapter of song"
who is promised that he lives in the emergent world. the sound of rejoicing and the sound of holiness. all the time, at every moment. in her mighty truth and magnificence. to the King to Whom wholeness belongs. This is no academic exercise. There will be no deep history or psychoanalysis of this guy. To me, he's at the top of the mountain. The selections below illustrate why I think that. This guy was a jazz astronaut, going places nobody had gone, simply because they couldn't. His steps were, indeed, Giant. Eric Clapton is my favorite guitarist. I'm not going to get involved in comparisons to others, or claims of "the greatest". I'll just say that his approach to the blues, both as a guitarist and vocalist, resonates deeply with me. This resonance dates back to my first recollection of hearing his searing sounds in Cream in the late 1960s. I found the strains of "Sunshine of Your Love" more than unusual -- they were downright unsettling. As you'll note from the selections below, I lean toward those songs that seem to most deeply express his suffering in particular and human suffering in general. And therefore my suffering. As Kook wrote, "There is a one who sings the song of his soul, and in his soul he finds it all, full, complete spiritual satisfaction. These are, to my ear, the song of one who sings the song of his soul. I first encountered Immy when she was in Frou Frou, and have followed her devotedly since then. I've always loved musicians who could handle every task facing a musician -- singing, songwriting, instruments, production -- and she is that and much more. 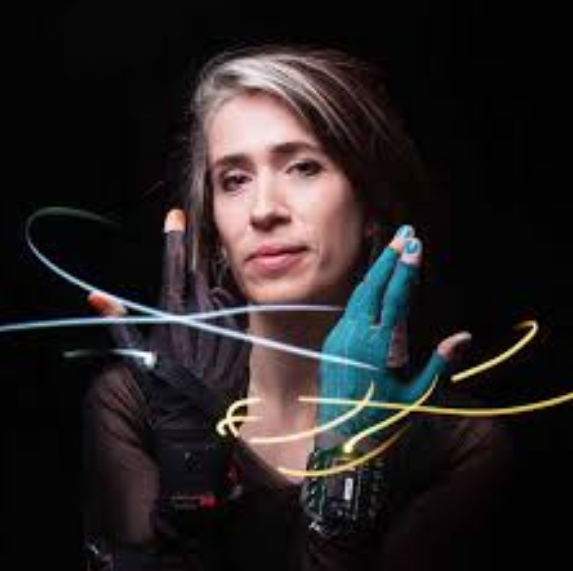 She's even worked with engineers at MIT to develop gloves that serve as an interface with her rather musical computers. Immy's web site here.